#stampinup This week's color challenge at the Stamp Ink Paper blog brought to mind a nautical theme. I thought about going straight to the "Traveler" set, but that would have been an obvious choice. Then I spied the "Sea Street" set on my stamp shelf and realized it hasn't gotten as much love as that cute set deserves, so I pulled it off and got ready to add some ink. I stamped the cute octopus in Bermuda Bay onto a Whisper White panel. Then I stamped him again onto a scrap paper and fussy cut his lower half so that I could use it as a mask. I stamped the school of fish in Bermuda Bay across the panel. I stamped the first image with full strength ink and the images to each side in the next "generation" of the stamp so that each image is lighter than the first. I thought the sentiment from the "Build a Birthday" set would be great with this design. It's stamped in Night of Navy ink. Then, since I apparently cannot get enough of the balloons from the "Party Wishes" stamp set, I stamped two balloons in Night of Navy and one in Pool Party and punched them out with the matching balloon punch from the Party Punches set. 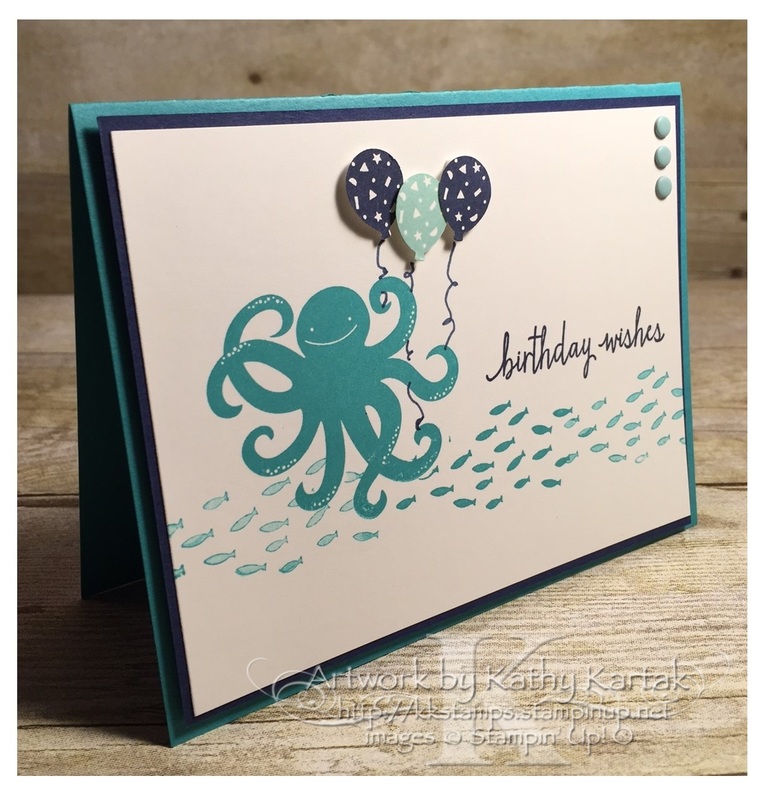 I added the strings with a Night of Navy Stampin' Write Marker--I hope it looks like the octopus is holding the strings! For a final touch--because I realized I hadn't used much Pool Party--I added three Pool Party Candy Dots to the corner of the panel. The Whisper White panel is adhered to a Night of Navy mat, which is adhered to a Bermuda Bay card base with Stampin' Dimensionals.